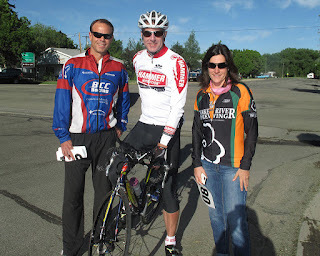 This blog entry begins with a photo of something other than a bike for a change, and slightly outside of Idaho. 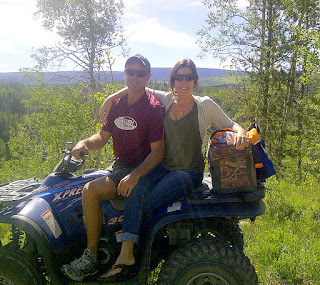 It had been years since I'd ridden an ATV - around Driggs or anywhere else - and was a blast getting back in the saddle at my parents' cabin a couple of weeks ago. Melissa & I were like kids at Christmas, covering ground and laughing til we cried...but I'm getting ahead of myself. First, a few other June adventures. 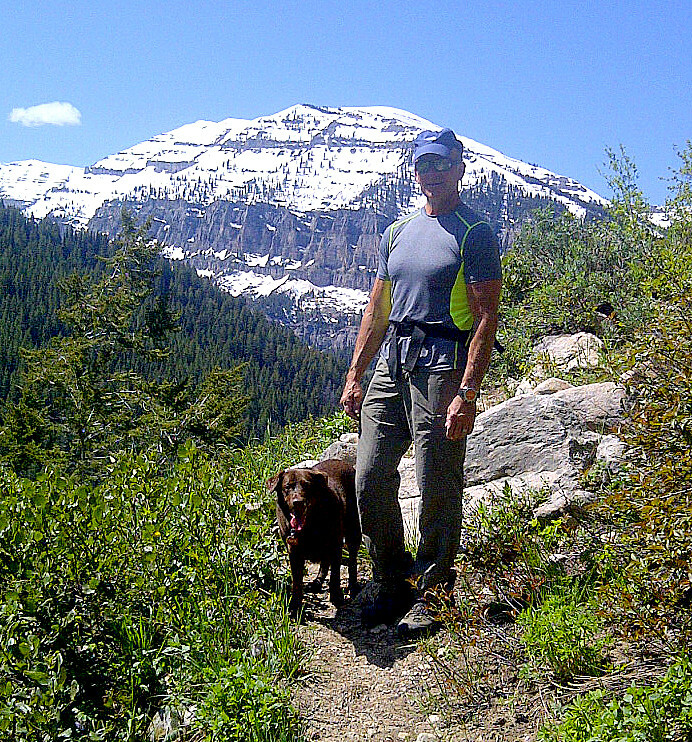 My buddy Gary is an avid hiker, and knows the Teton backcountry like few others. 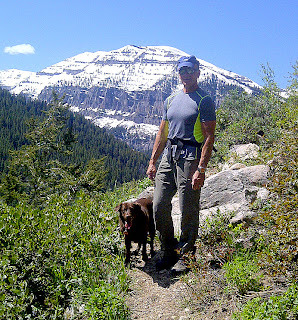 We connected back in early June for a scramble up the backside of Mary's mountain. It was a brilliant afternoon, and his dog Marley made it even better. 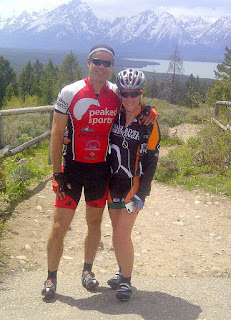 About once each year, I decide to bike to the top of Teton Pass. It's ridiculously steep, and sometimes feels like it's tearing me down more than building me up in terms of training. 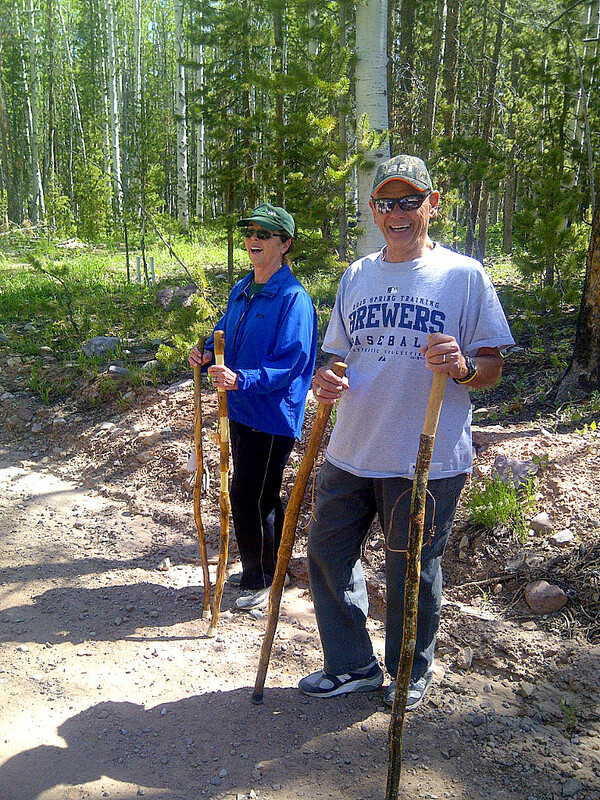 But Melissa & I did it in preparation for the High Uintas Classic race, and it probably made us stronger. June 9-15 was Idaho's "Bike Week," and several local events were organized accordingly. One evening was a Kids Bike Clinic in Victor, and we volunteered. It was awesome teaching a few things to the next generation, watching them gain confidence, and remembering what riding a bike is all about. In nearly two decades of living here, I'd never biked to the top of Signal Mountain in Teton Park (I usually ride that area during spring, when Signal Mountain road is still under deep snow). 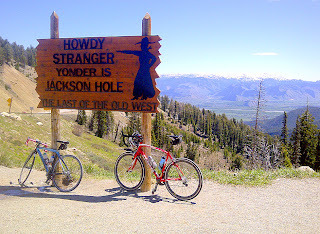 We made the trek over to Jackson this month, and got 'er done. Simply beautiful. Back to the weekend at my parents' cabin. 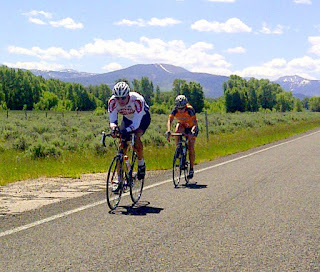 The primary purpose (at least theoretically) was the High Uintas Classic bike race, a 77-mile journey from Kamas, UT to Evanston, WY. It follows the Mirror Lake highway up & over 10,700 foot Bald Mountain Pass, and had been on my bucket list for twenty years. Melissa & I signed up a few months ago, trained the best we could, and talked friends Kevin & Deb into driving down with us. 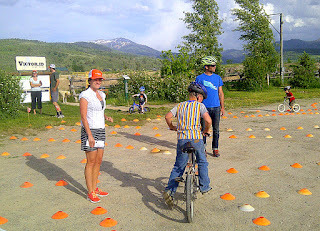 Deb handled support duties for everyone, and Kevin joined us racing. Quickly, I was chasing dozens of young, lean, fast dudes like this. 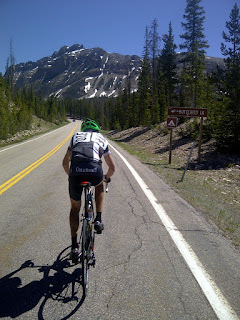 Climbing over 5,000 feet in the first 30-miles, it was all I could do to hang on and squeeze out a mid-pack finish. At least the weather was perfect. 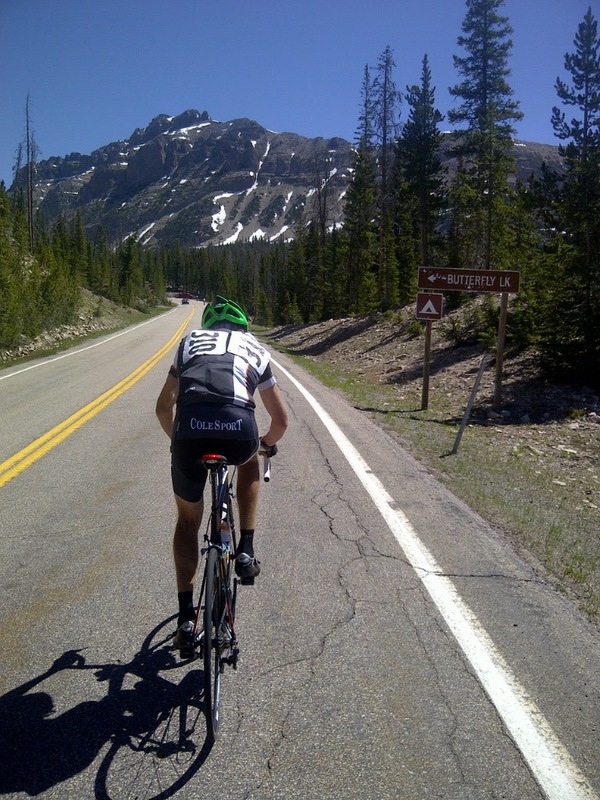 And wow, the altitude & high country scenery were equally breathtaking. There were no official race photographers, but fortunately I took a couple of pictures myself. Here are Kevin & Melissa, bringing it home to Evanston. My folks built their cabin back in the late '80's, just a few miles from Bear River Service in the Uintas. 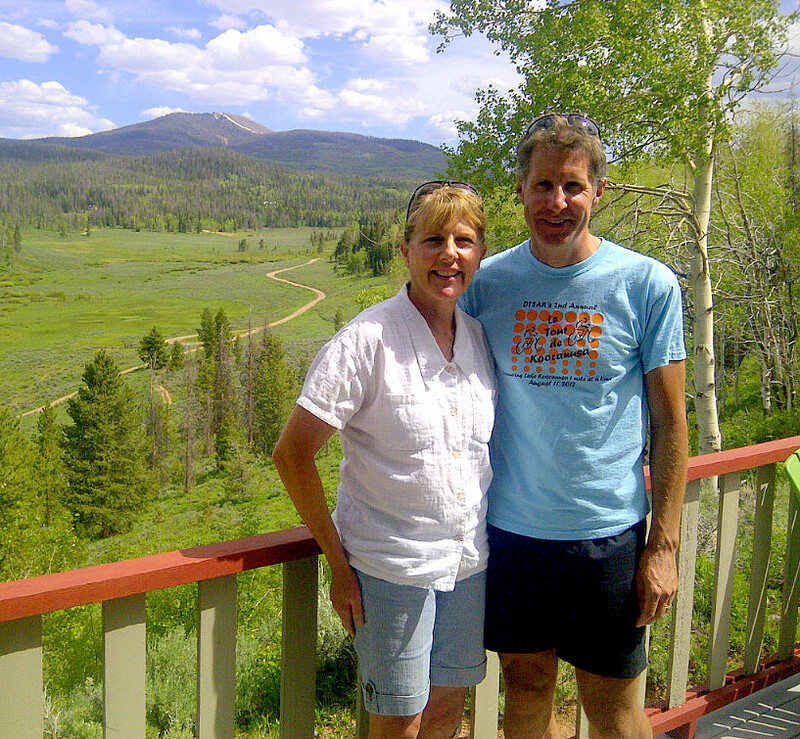 Our race route went close by, so we spent the night after with mom & dad. It had been almost 18 years since I'd visited, and was wonderful to be back; lots of memories, and such good energy there. 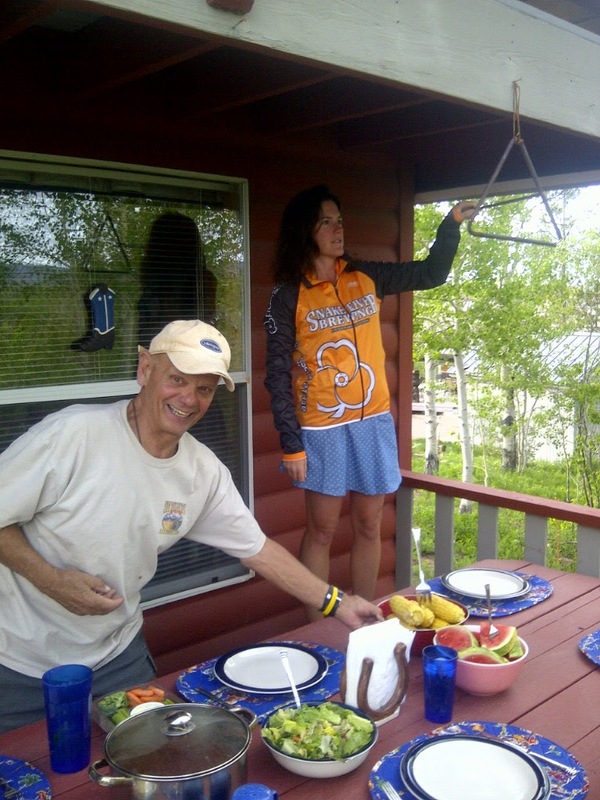 Dad got busy setting the table, and Melissa had some fun ringing the dinner bell. It was an old school weekend all the way around. 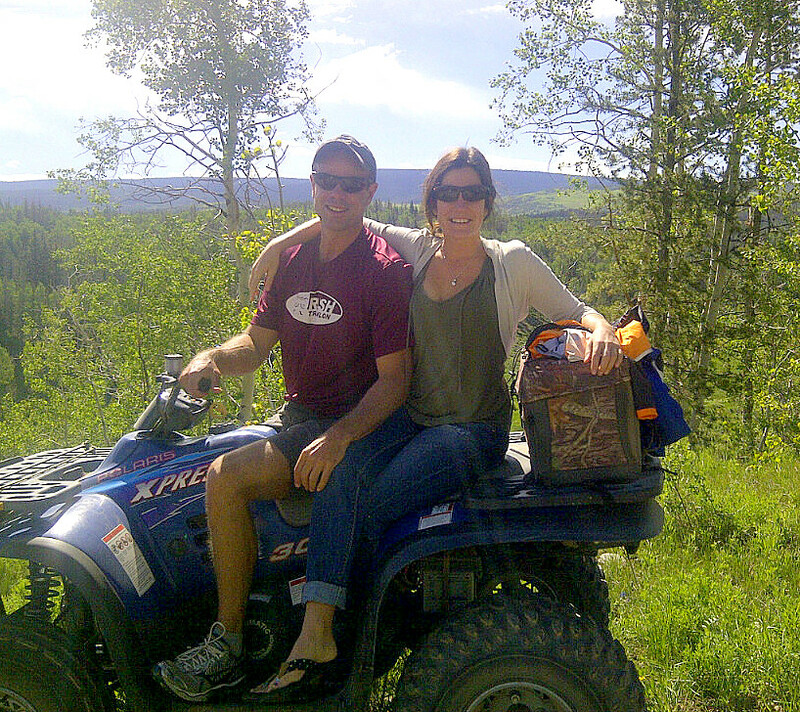 "Do it All" Deb & "Man of Steel" Kevin, taking in the cabin views. Mom & dad, on their routine morning walk in the woods. They're kinda happy. 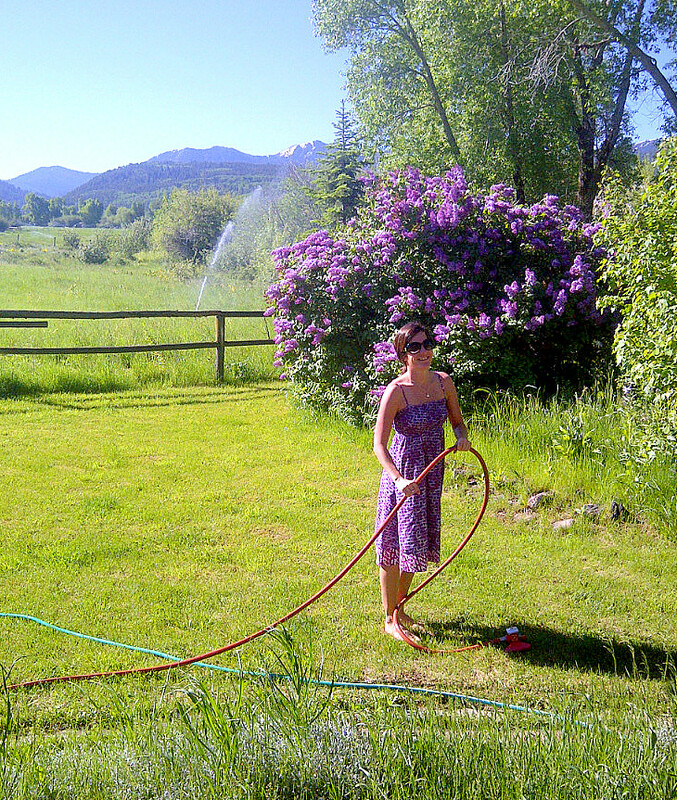 As summer unfolds, weekly traditions develop. 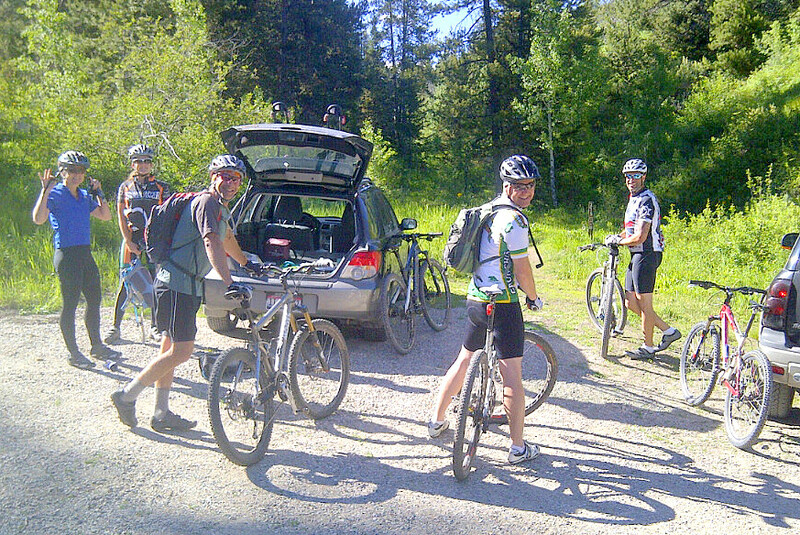 Last week we did our first group Teton Valley weeknight mountain bike ride, from Spooky trail to Corral Creek and beyond. Friendships blossomed, and crashes were minimal. 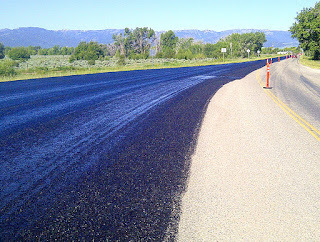 Another June highlight was several days of work right here in my hometown, sealcoating the roads in Driggs. It's an environmentally friendly and economical product, with no messy chips involved. The roads are rejuvenated, and cyclists love it, too. Melissa loves summer...can you tell? Her dress even matches the lilacs; pretty, and blooming. Here's to June, and summer smiles! Hi! I came across your blog while looking for info. on the Driggs/Victor area. My husband is interviewing with a company in Jackson Hole, so we are looking at the area to see if it's a job we want to consider. We currently live in South Jordan, a suburb of Salt Lake City, UT. I first wanted to say that I am enjoying reading your blog immensely. Your passion for the outdoors, and life in general, is contagious. I was wondering if you could answer a question for me? I feel like Driggs, for me, would be a dream come true. I grew up in Alaska and then Wyoming, and have a deep love for nature. My husband, however, is more of a "city boy". He prefers movies, books, and eating out. I'm worried that a move to such a small, outdoorsy town would leave him with little to talk to others about, and make it a challenge to make friends/feel part of the community. Sorry for the novel...here's my question: Are there any "city folks" living in Driggs, or is everyone there living the outdoorsy dream? Hi Crystal...thanks for the nice comment! I'm originally from the SLC area, have been in Driggs for over 18 years now. Your concern is well-founded; Teton Valley is paradise in terms of outdoor recreation, but if you're a city person it will leave you wanting more. That being said, there are a surprising number of "city folks" who either live here or have second homes here. I believe there's a balance to be found. What parts of Alaska & Wyoming are you from? And what about your husband...is he a SLC native? For me, living in Driggs and visiting cities has been perfect. I always enjoy the short-term stimulation of a city - restaurants, shopping, sporting events, etc. - but coming home to Teton Valley lights fills my soul again. You might consider renting a place here for a month (or three?) to start with, and see how it feels. Hope this helps, and keep me posted!